It’s taken a long time – late April through early May was hectic – but today I’m thrilled to finally announce the launch of the “Organic Chemistry Reagent Guide“, a guide designed especially for undergraduate students taking Org1/Org 2. It’s has pretty much all the reagents you need to know about, from Ag2O to Zn(Hg). This document is the result of well over a hundred hours condensing and summarizing all the information about reagents from standard textbooks – their structures, reactions, and mechanisms – and putting them all in one place for easy reference. 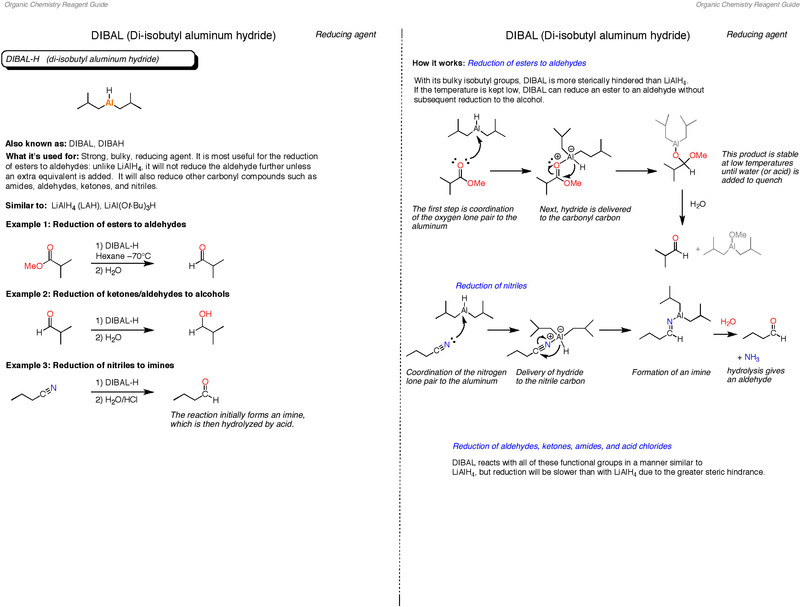 -a front section with extensive tables, including lists of acids, bases, oxidizing agents, reducing agents, reagents that add to aromatic rings, and organometallic reagents. 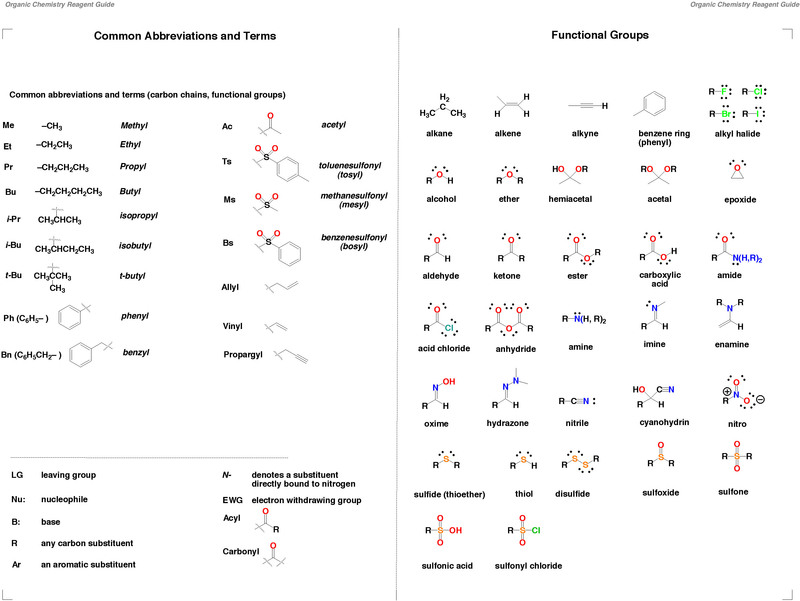 Plus tables of common abbreviations, solvents, and pKas. There’s even a guide to Greek! 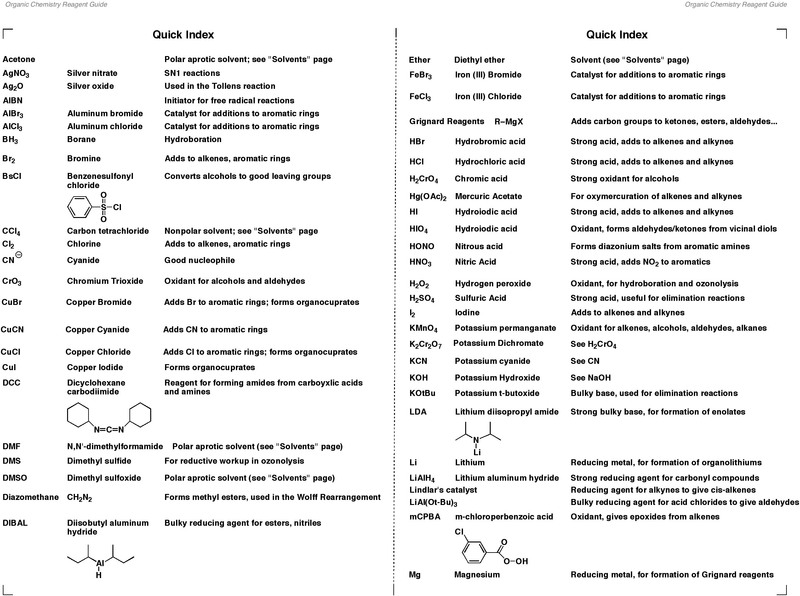 -a quick-reference index, with 2 pages of condensed information on every reagent covered in the book. As far as I know there isn’t anything else like this available. I hope this is the perfect desktop companion for anyone taking introductory organic chemistry. I want to thank all the students, friends and colleagues who were able to look over the first draft and give helpful suggestions, and especially to those who suggested I do this in the first place. Accuracy is paramount for a document like this. I pay a bounty for typos and mistakes. If you buy the Guide, and tell me about any typos or mistakes you find – or have suggestions for things that have been omitted – I’ll send you a $5 reward through Paypal. You can use it risk free. If you are not completely satisfied that this is a useful guide for your course, I will give you a refund within 30 days of purchase. UPDATE – version 2.0 released with even more reagents and spiffier graphics. Due to all the additional time spent to make the new version so polished, the regular price is now in effect. Did you go through and color code all the atoms by hand in ChemDraw? That’d take up 95% of the time for me! Or did you have some shortcut way to color code the atoms? I would color code the starting molecule, and then through cut/paste, the subsequent molecules would be color coded. But yes…. it was very time consuming. Looks nice though! Nice work! This will be very useful. Structure of the isobutyl group is incorrect on the first pdf, which is actually of the secondary butyl. Is this a PDF file or a real hand-held book? Is this only sold as a pdf file or can this be bought as a physical hand-held book? Thanks for the post it’s an awesome way to learn the reagents quickly!! !